Sizes: Adult--1" to 1 1/2"
Identification: Adults have long, thin bodies; wings are folded together when at rest (dragonflies hold wings out perpendicular to the body). Most are metallic blue, bronze, or green; blue is the most common color. 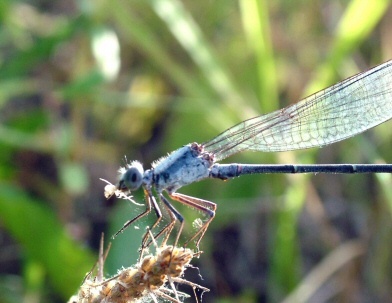 Damselflies are similar to dragonflies, but the adults can be differentiated by the fact that the wings of most damselflies are held along the body when at rest. Damselflies are also usually smaller, weaker fliers than dragonflies, and their eyes are separated. Biology and life cycle: Adults lay clumps of eggs on the surface of water or on plants. Nymphs are very active underwater predators. Habitat: Swamps, ponds, boggy places, drainage ditches, and lakes. Feeding habits: Damselfly adults catch and eat flying insects such as gnats and mosquitoes. Economic importance: Eat several troublesome insects. Natural control: None needed. Birds, frogs, and possibly dragonflies. Insight: One of the most beautiful insects in the garden. And they're beneficial.